Cleats & Couture: "I voted for Cady Heron, because she pushed her." "I voted for Cady Heron, because she pushed her." I pretty much avoid saying anything political because I have friends all over the political spectrum and have no interesting in offending anyone, but I will say this: please get out & vote today. You have no right to sit behind your incessant Facebook statuses or tweets if you aren't rocking an "I voted" sticker today. Now is your chance to put some action behind those words. 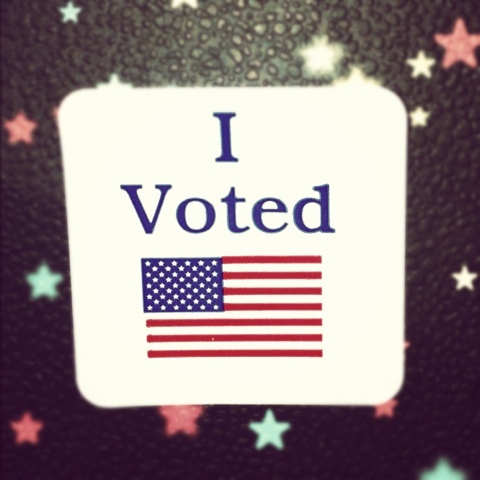 We are blessed as a country to be able to cast our votes in this election, so don't waste this opportunity.